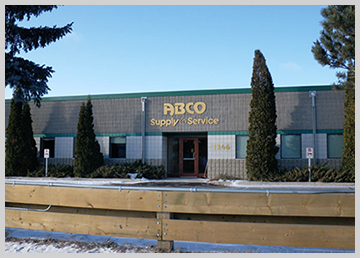 ABCO Supply & Service Ltd. is a privately-owned Winnipeg based Electrical/ Mechanical contracting firm incorporated in 1972. We are recognized as one of Western Canada’s most respected and successful multi-trade contractor and service company. Since our incorporation, we have staked our reputation on quality products & installations, quick response times with superior workmanship. We are proactive in continually reviewing and upgrading our training, safety, procedures, and techniques to exceed the ever-changing demands of the industry. We own and operate a 33,000 square foot complex consisting of our head office, warehouse, and fabrication facility. Our fabrication facility has a 5-ton indoor overhead crane enabling us to pre-fabricate many of the complex mechanical piping systems used within our industry. With our millwright division, we also custom fabricate and modify many components for clients in the manufacturing, food & beverage, oil, gas, mining and utility industries. We approach every undertaking with a great degree of pride and a philosophy of providing uncompromising quality, whether it is a small retrofit or major construction project. It is the mission of ABCO Supply & Service to provide our customers with the highest quality workmanship, products, and services. Our vision of becoming a recognized leader in our industry will be achieved through operational excellence, use, and knowledge of leading-edge technology, complete customer satisfaction and the continuous development of our valued experts.